Livings, Liam. “Best Friends Perfect, Book 2”, Wilde City, 2014. 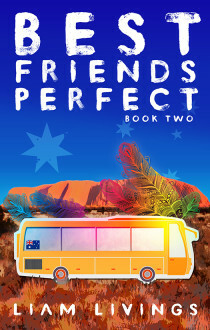 This is the second volume in Liam Livings’s “Best Friends Perfect” series. Set in 1999, eighteen year old Kieran is searching for his soul mate in Australia and London. His best friend Jo is there to help. What was not supposed to happen did—Kieran falls for a straight guy but Jo has the solution for this except that Kieran does not agree with it. He introduces Jo to his other best friends and they all think she is just fine. Then Jo and Kieran are off to college in London where they meet two Irish students, Sean and Andrew and twists and turns come our way. Once again Livings has created wonderful characters and he has done an excellent job of developing the plot. He actually writes the kinds of stories that do not require anything more than opening a book and enjoying a read. Give him a try. This entry was posted in GLBT fiction on September 29, 2014 by Amos.